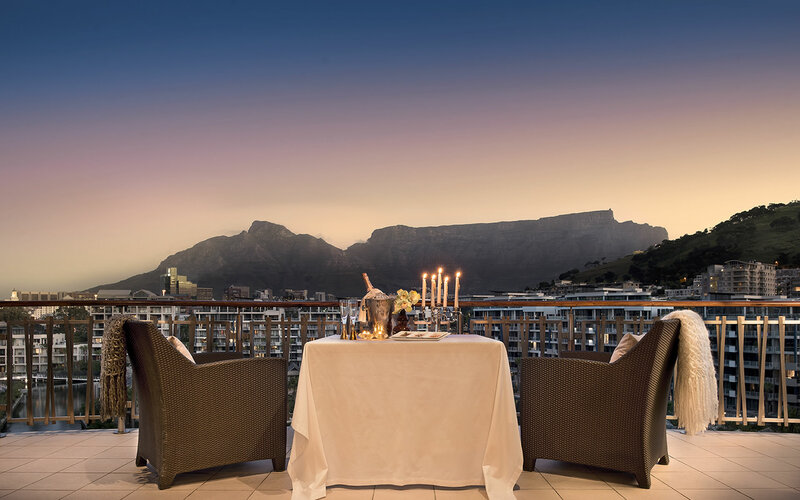 Rising proud, seven storeys above the magnificent canals of the Victoria & Alfred Waterfront is the iconic One & Only Hotel. The name certainly speaks for itself as it really and truly is a wonder to behold, an exquisite marina rise on its very own private island. From The Bahamas to the Maldives the illustrious One & Only brand has taken the world by storm. 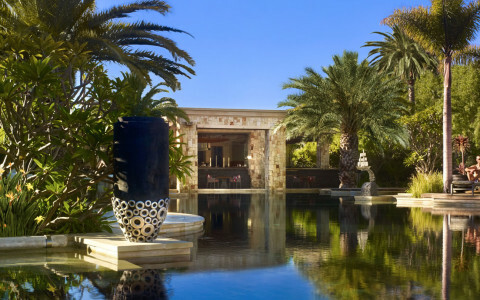 With only the most impressive properties in the world’s most supreme locations, these exclusive resorts have one goal in mind to ensure that you, their prized guest “Live the Moment.” Each resort is individually designed and crafted to represent the distinctive life, energy and culture of its location. The One & Only Cape Town certainly ticks all of these boxes. Driving up to the ritzy, crescent shaped palace with its fountains, columns, and grand entrance you certainly feel as though you have arrived into the lap of luxury and are in for some real spoiling! The high ceilings, massive glass frontages and never-ending Vista Lounge create the aura that this is your own little opulent savannah. Our favourite are the life-size standing lamps in the lounge! Not that we would expect anything less… the staff all exude the ultimate in African fair and hospitality, unrivalled in the rest of the world. The One and Only is surrounded by the Victoria & Alfred Waterfront which was once a trading refreshment station and is now the Cape’s most prestigious shopping and entertainment hub. Home to more than 450 retail outlets, 80 restaurants and bars, cinemas, markets; there is definitely something for the whole family. We recommend a celestial dinner at Harbour House, a casual lunch of fish and chips at Quay Four, and a breakfast pancake while strolling around the Watershed Craft-Market. Whether you are reclining on the fulsome armchairs, on the deck under the palms watching the stand up paddle boards go by or relaxing at the infinity pool, there is no doubt that you will be in a very happy place! The One & Only is engineered for unprecedented luxury which will literally rejuvenate your soul from the moment you arrive. 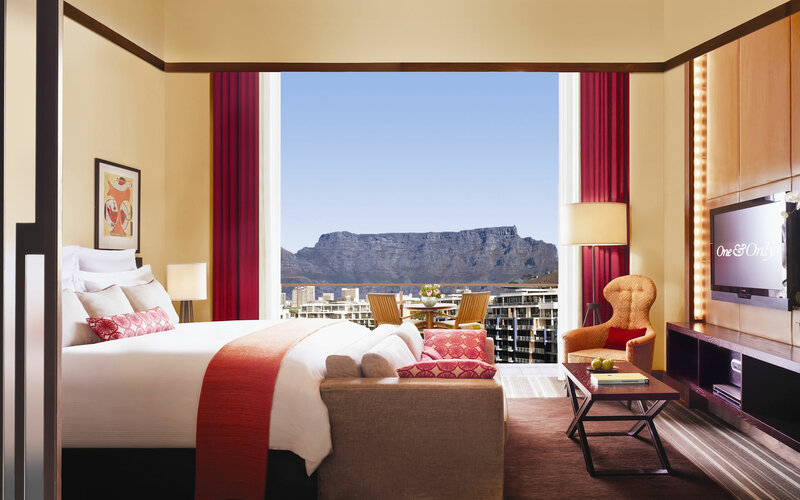 All 91 rooms have en suite bathrooms and private balconies with breath-taking views of the glorious Table Mountain. 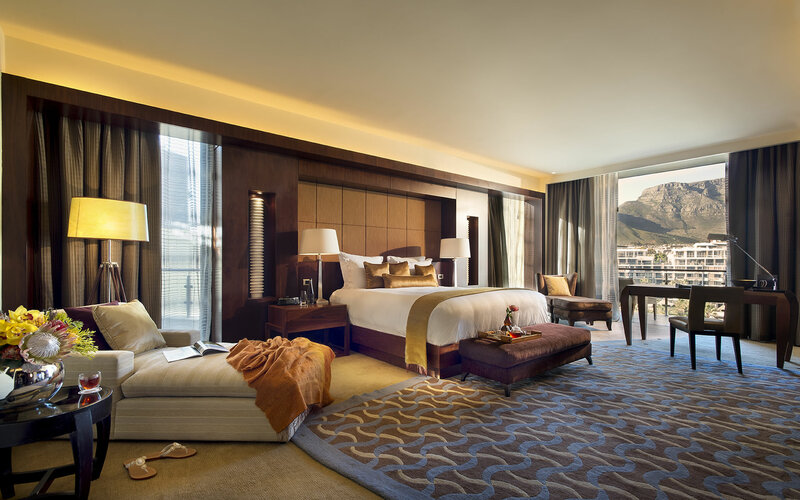 All are designed with chic African colours and contemporary patterns that represent the distinctive Cape landscape, are generous with space and filled with plush furnishings. Complete with every amenity you could possibly need as well as your very own 24 hour butler on stand-by, you will want for nothing. Treat yourself to an over-sized bubble bath with aromatherapy oils, or refreshing rain shower before ordering a private dinner and dine with the mid-blowing view on your balcony. Your dinner, inclusive of candles, flowers and music all organised by your expert butler will provide the finest romantic setting. Five-star dining is also available downstairs and making a choice between the two amazing restaurants will be the most difficult decision you make during your stay. On the one hand there is Reuben’s, run by South African Celebrity Chef Reuben Riffel, a bistro/brasserie that showcases some brilliant local flagship dishes. The Roasted Duck Breast and White Chocolate Panacotta are the highest on our very long “highly recommended list!” Let’s not forget the mouth-watering breakfast buffet… never will you have ever woken up to such a spoiling! On the other hand there is Nobu, a completely different yet equally as astonishing experience. World Class chef Nobuyuki ‘Nobu’ Matsuhisa’s empire will wow you with traditional Japanese-styled cuisine. With the occasional South African spice or flavour the dishes will no doubt take you on an epic culinary journey. Don’t have too much Sake (rice wine) though… you need to make sure you can relish all of these tantalizing tastes! Don’t forget to take a visit up to the wine-loft after your dinner to take in the city lights and sample some of the region’s most prestigious vintages. The One & Only also offers an infinity pool and fitness centre complete with customised programmes for guests. Once you have worked off your breakfast, take a trip to the sensational spa where you are promised an unparalleled treatment experience. Surrounded by aquamarine water and leafy green vegetation, the setting is the ultimate, so why not have a magnificent manicure or hot stone massage and let the world fall away around you. We must warn you though, if you lie down on one of their spectacular day-beds you may never get up! A year round destination and only 25 minutes from the Cape Town International Airport this dream is only a click away. Fully equipped with a kids club and the most incredible romantic experiences the One & Only is ideal for a couple’s getaway or a fun-filled family holiday. Be sure to contact Iconic Africa for our exclusive rates. We would love to tailor make the perfect holiday for you and can add on an out-of-this-world safari experience or a wonderful-retreat in the Winelands, whatever your heart desires. Unprecedented luxury, which will rejuvenate your soul from the moment you arrive. Surrounded by the Victoria & Alfred Waterfront. The One&Only combines luxury and location to ensure your ideal luxury stay in Cape Town. Simply contact one of our African travel experts and let us tailor make your journey to this and other majestic African destinations! Royal Chundu, the first Relaix Chateaux property in Zambia, is 14 suites of majestic and secluded opulence nestled on the Zambian bank of the immense Zambezi River. Here, upstream of the Victoria Falls, the river is a wide and tranquil elixir that supports myriad bird, fish, mammal and plant life. Elephants graze the banks and islands while tiger fish dart through the water after any morsel. Royal Chundu represents a commitment to unbridled luxury in the wilds of Africa and the constant support of local communities. Tinga is a rare treasure – a private lodge and concession in the world-renowned Kruger National Park. The diverse 5000ha concession in this conservation icon is one of South Africa’s most game rich regions and is refuge to the highest concentration of endangered black rhino in Africa. Tinga is a luxurious celebration of Kruger heritage with nine spacious and secluded private suites nestled on the banks of the magnificent Sabie River.